First off, a big thank you to Yahoo! for sponsoring today’s post. Their food page boasts a well-curated selection of stories from around the web, courtesy of their editing team. While perusing the site, I stumbled upon a beautiful and unusual recipe for Cauliflower Cake by one of my favorite chefs, and I couldn’t wait to make it in my own kitchen. Yotam Ottolenghi is one of those chefs who knows exactly what you want to make before you do. His recipes are inventive but accessible, amping up vegetarian dishes with vibrant herbs and spices. Ottolenghi is great at putting a spin on things — whether it’s a revolutionary combination of produce, perfectly balanced and layered seasonings, or a fancy-but-functional cooking technique, his creative cookbooks always teach me something new. And isn’t that what we all want out of a good cookbook? One that takes us just a few steps out of our comfort zone, transforming our everyday meals with a little bit of chefly magic? I love the way the recipes in Plenty More require you to go out and find maybe one or two obscure ingredients, but overall, they’re familiar enough not to intimidate a home cook. You’ll learn how to use pomegranate molasses, black caraway seeds, tahini, and other flavorful Middle Eastern staples, gently expanding your pantry as you cook through the book. 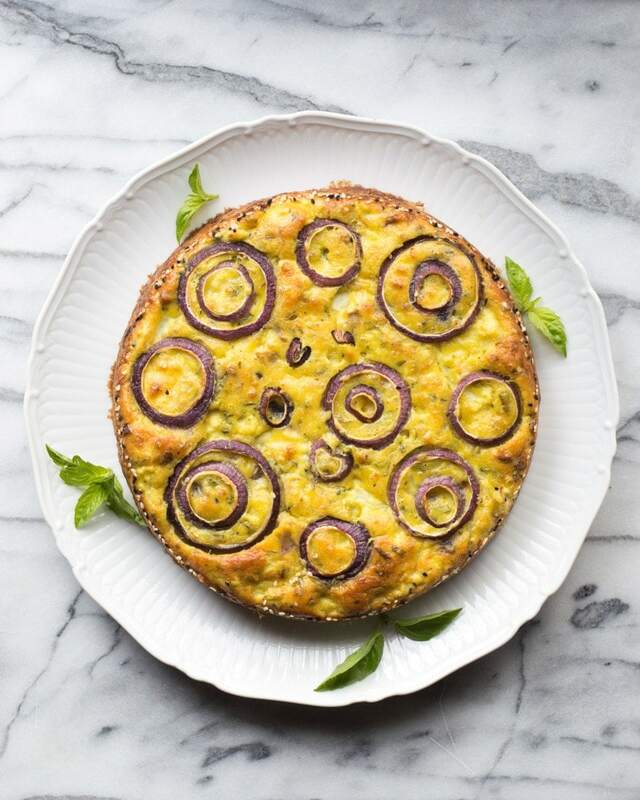 You’ll find the original recipe for Cauliflower Cake on Yahoo!’s Food site. In my adapted version below, the ingredients and method are the same, but the instructions are a little more thorough. When making the dish, I wished Yotam was a bit more of the hand-holding type, giving me a few more details, like exactly how the heck I was supposed to line a springform pan with parchment paper. Hint — you’ll need three pieces of parchment, one circular one to line the bottom, and two strips to line the sides. There are some really nifty techniques at play here. 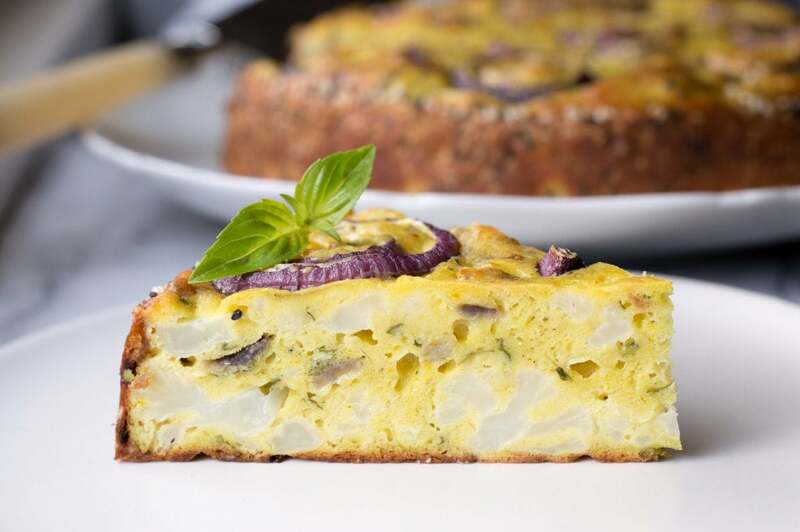 What looks like a frittata to the naked eye is truly a “cake,” as the recipe title implies — it contains a cup of flour, enough to bind the dense batter that keeps the pieces of cauliflower evenly distributed throughout. Each slice contains beautiful cross-sections of the florets, contrasting with the vibrant yellow, turmeric-tinted cake. Oh, and there’s no need to decorate this cake once it comes out of the oven. The parchment paper lining the pan is sprinkled with sesame and nigella seeds, and they stick to the sides of the cake as it cooks. 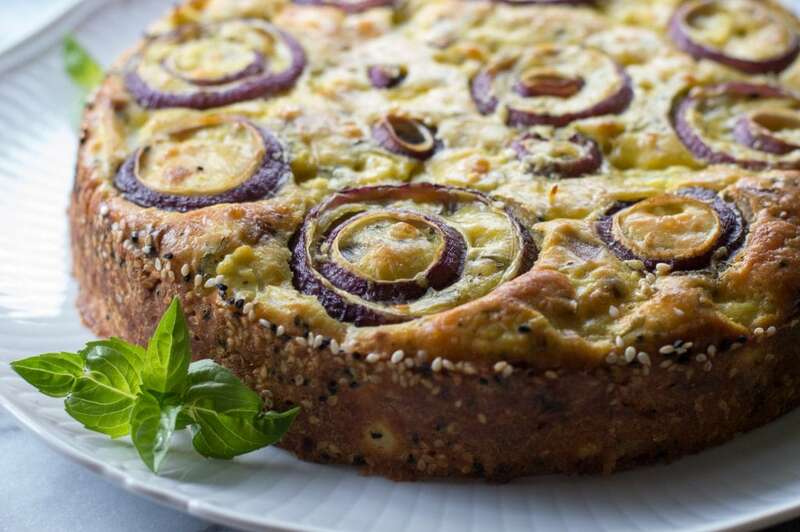 The top is taken care of with rings of red onion, which are artfully arranged just before baking. I like to place them evenly around the perimeter of the cake, providing a guide to slice eight even wedges after it’s baked and cooled. Without further ado, here’s the recipe. I urge you to track down those nigella seeds — also referred to as black caraway, you can find them at any Middle Eastern grocery store. Their slightly oniony, toasty flavor adds a great dimension to the dish. Again, my thanks to Yahoo! for sponsoring this post. Check them out if you need a little kitchen inspiration! A beautiful brunch, pot-luck, or light dinner dish. Serve with a salad alongside. Place the cauliflower florets and one teaspoon of the salt in a medium (3-quart) saucepan, and add water to cover. Bring up to a boil over medium-high heat, then turn down to low and let simmer until soft but not falling apart, about 15 minutes. Drain the cauliflower in a colander and set aside to cool. Peel the onion and trim off the dry stem end. Cut off four 1/4-inch thick slices of onion rings from the stem end and set aside. Dice the remaining onion. Heat the olive oil, diced onions, and chopped rosemary in a small (8-inch) skillet over medium heat. Cook for ten minutes, stirring often, until the onions are just beginning to brown. Remove from the heat and set aside. Cut out a 9-inch circle and two 15-by-4-inch strips of parchment paper. Open the latch of a 9-inch springform pan to expand the outer band. Place the parchment circle in the bottom of the pan, and arrange the strips of parchment along the inside of the outer band, overlapping them slightly. Close the latch of the pan, securing the parchment strips. Don’t worry if they curl in a bit — when you brush them with melted butter, it will tack the paper down neatly. In a small bowl, microwave the butter just until melted, about 20 seconds. Use a pastry brush to apply it to the parchment paper in the pan, covering the bottom and sides. In another small bowl, stir together the sesame and nigella seeds. Hold the lined, greased pan over the sink, and sprinkle the seed mixture evenly onto the parchment strips on the sides of the pan. In a large mixing bowl, whisk together the sautéed onion mixture, eggs, cheese and basil until the yolks and whites are thoroughly blended. Whisk in the flour, baking powder, the remaining teaspoon of salt, pepper, and turmeric. Finally, use a spatula to gently fold in the cauliflower florets, taking care not to break them up in the batter. Pour the batter into the lined baking pan, spreading it out evenly with the spatula. Tap the pan firmly against the counter top to remove any air bubbles. 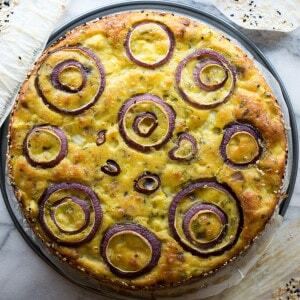 Arrange the rings of red onion on top of the cake batter — they will sit on top, sinking in just a bit as the cake cooks. Bake the cake until golden brown on top and fully cooked through, for 45 minutes or until an instant-read thermometer registers 195ºF in the center of the cake. Allow the cake to cool for at least 30 minutes. Use a sharp knife to slice into wedges and serve warm or at room temperature.